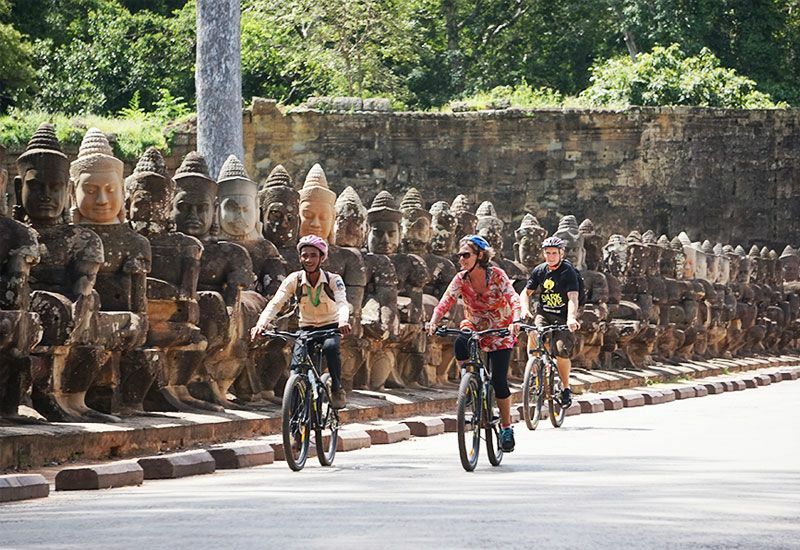 Through the tour, you will bike down narrow dirt lanes around Angkor complex and explore the hidden temples covered by jungle. The tour takes you on a spiritual and educational journey around the temples with our experienced tour guide. Start the morning temple exploration at the most illustrious temple with fewer crowds. First, you will visit Ta Prohm which is unique in that it has been left largely as it was found- overgrown by jungle trees and vines. Head out to the ancient city of Angkor Thom, enter the city through the ancient Gate, an impressive stone gate carved with elephants and four giant faces. Bayon Temple found in the centre of the city famed as the enigmatic faces representing the 54 provinces of the Great Khmer Empire. Lastly, we will bike to the gem of the Angkor complex, Angkor Wat. Following your storytelling guide, you will be memorised by the rich history and symbolism of this unique ancient temple. Cycle back to Siem Reap town and finish your tour at your hotel. Angkor Wat pass is not include on the tour. The tour takes you on a spiritual and educational journey around the temples. During this tour, you will visit the legendary temples such as Angkor Wat, Angkor Thom, Ta Prom and enjoy multiple attractions lead by our educational tour guides. It was a perfect bicycle day arround siem reap.